Dial Moisturizing Body Wash comes in many different scents. I tried Coconut Milk and Hibiscus Water. Coconut Milk smells exactly like you would imagine it would, tropical and luscious. Hibiscus Water has a floral sweet scent to it that reminds me of the beautiful flower it is named after. Dial Moisturizing Body Wash is a very nice body wash. It is an advanced body wash that has a moisture-attracting formula for lasting, lightweight hydration. The Hibiscus Water provides 12 hours of freshness and the Coconut Milk provides 12 hours of moisture. They are both moisturizing, clean rinsing and provide a rich lather. The Coconut Milk Body Wash is specially formulated to release moisture for up to 12 hours and leaves skin feeling soft and moisturized. This is great for those with dry skin. The Hibiscus Water formula is specially formulated for freshness lasting up to 12 hours and helps skin feel healthy and fresh. This is great for those who tend to perspire more. I have dry skin so I really liked the Coconut Milk Body Wash. It left my skin feeling so soft and silky. I really like this body wash, a lot! My daughter really enjoyed the Hibiscus Water Body Wash and almost used up the entire bottle! 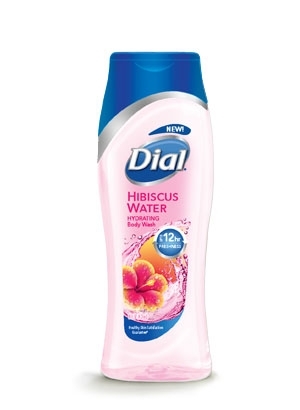 Dial Body Wash can be purchased at any major mass market outlet such as Walgreens, Rite-Aid, CVS, Target and Walmart. Like Dial on Facebook: https://www.facebook.com/Dial; Follow Dial on Twitter: https://twitter.com/dial and Subscribe to Dial on YouTube: https://www.youtube.com/user/dial.